Saturday, September 24 NMCSS is sponsoring a day trip to Los Alamos. The trip will include a visit to the Los Alamos Historical Museum in the morning. In the afternoon, the group will visit Bandelier National Monument. The purpose of this trip is to promote collegiality among out stat social studies teachers. See the NMCSS website for forthcoming details on the time and meeting place. At Bandelier National Monument, one of the National Park Service’s oldest sites (1916), you will find Ancestral Pueblo dwellings scattered across a landscape of broad mesas and steep-walled canyons that provide habitat for a diversity of plant and animal life. Although best known for archeological sites, Bandelier also includes 23,000 acres of designated wilderness. Over 70 miles of trails vary in difficulty from easy footpaths good for the whole family to more challenging ones best for experienced hikers. 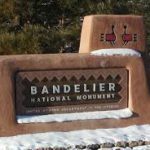 Permits for overnight stays in Bandelier’s backcountry are available at the Bandelier Visitor Center.